Whew! It's good to be blogging again! My schedule has been so hectic lately with long hours and travel for work, two new babies in the family, and stamping! 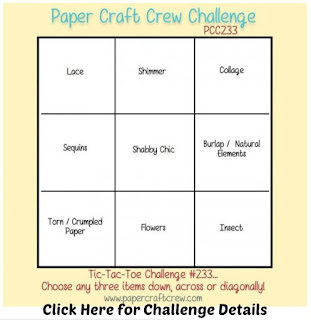 Today I'm showcasing my entry for this week's Paper Craft Crew Tick-Tac-Toe challenge! I had so much fun playing with the options for today's card. For my project, I went diagonal with Collage, Shabby Chic design, and Torn/Crumbled paper. I am thrilled with how this card turned out! Have you experienced that amazing feeling when your project turns out 1000x better on paper (literally) than the plan in your head??? That's exactly how I feel about this card! There a few special touches I added to this card to create a Shabby Chic design. The flowers are stamped in Early Espresso onto Crumb Cake, and to fill the blank space in between the rich images, I stamped off twice onto scrap paper and filled in with a very lightly inked image. A couple staples to secure the rolled burlap ribbon add a whimsical touch - just like that small linen thread bow to gather the ribbon near the end of the piece. 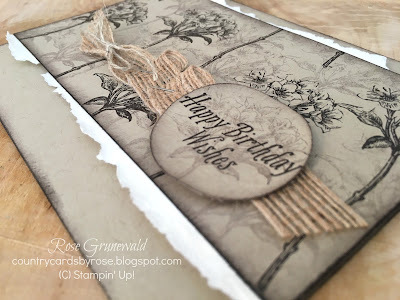 I used a bone folder to rough up the edges of the punched Happy Birthday Wishes circle and torn Very Vanilla layer. Finally, some light sponging in Early Espresso around all the Crumb Cake edges give that perfect antiqued look, don't you think? 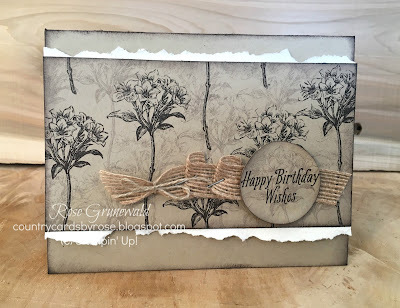 This card was very quick to put together, and it was a great way to use my Avant Garden stamp set from Sale-A-Bration! 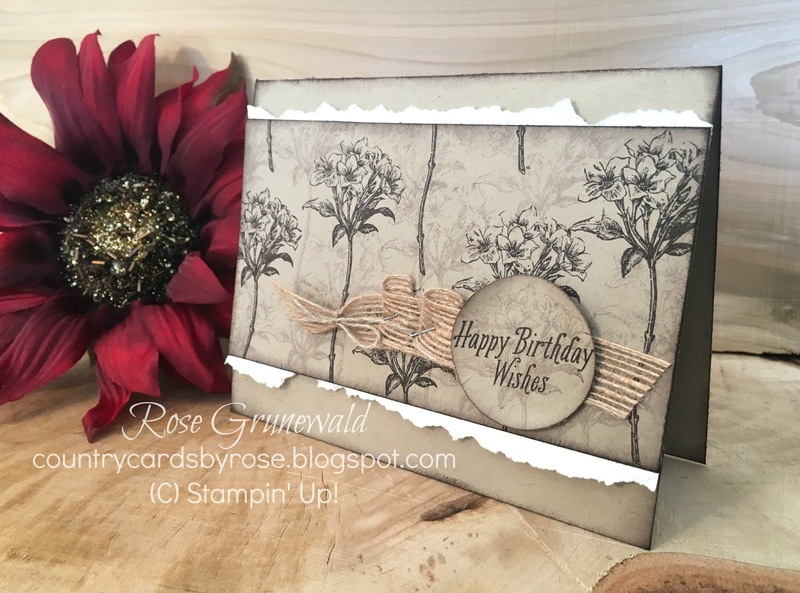 I have listed all the products I used to create this card below. Clicking any of the images will take you directly to my online store - don't forget to use my March host code CJ2P2JYPK when placing your order so you can be entered into my monthly prize drawing! I really appreciate your business - it's what allows me to keep bringing you fun projects like this, and I send a special thank you for every online order I receive.